If you’re coming to Windows 10 from Windows 8 or Windows 8.1, you’ll notice quite a few differences. Here’s what to expect. Until Windows 10, Microsoft released a version of Windows every year or two, and called it done. Other than receiving security patches, each Windows version stayed pretty much the same. With Windows 10, however, Microsoft treats the operating system much like a smartphone: constantly connected to the Internet, and constantly updating itself automatically. That means that Windows 10 is full of apps which constantly receive new features and updates. Don’t expect your apps to work exactly the same way each time you open them. And don’t be surprised to see Windows 10 itself change subtly, as well. Microsoft may tweak some features and menus whenever it wants. Windows 8 and 8.1 both featured a Start screen instead of a Start menu. The Start screen filled the screen with large tiles that represented apps. Tablet owners liked the large tiles because they were easy to poke with their fingertips. Desktop owners, by contrast, preferred the smaller Start menu, which allowed for more precise mouse clicks. Windows 10 brings the Start menu back to the desktop, shown below, but with a column of apps clinging to the menu’s right edge. If you prefer the full-screen Start menu, bring it back: Click the Start button, and choose Settings. When the Settings app appears, choose Personalization and click the Start link from the Personalization window’s left edge. There, you can turn on the Use Start Full Screen toggle. The Charms bar, that strip of icons hidden behind the screen’s right edge, is gone. Some apps still have traces of it left in a menu in their upper left corner. Click or tap that icon to see the familiar Search, Share, and Settings, as well as Print, on occasion. Now swiping in from the right brings the Action Center with its more pertinent notifications and easy access to a customizable grid of your favorite settings. Windows 8 and 8.1 came with an Internet Explorer app, as well as the traditional Internet Explorer desktop program. That bit of double-vision left people wondering not only which browser to use, but which one currently shows the website they’re trying to see. Windows 10 retires the desktop version of Internet Explorer and replaces it with Edge, a speedy new browser. It’s technically an app, but it looks and feels like a desktop program. Pointing in the corners of Windows 8/8.1 revealed secret, hidden menus. Only people who knew the trick would think to point their mouse into the screen’s right corners to summon the command-packed Charms bar. To avoid the confusion, Windows 10 removes the Charms bar, spreading its icons to other, more easily found locations. For example, the Charms bar’s Search icon now lives on the Start menu as a Search box. The Charms bar’s Start button is back on the taskbar. The Share icon now lives on inside apps that can share material, and the Settings icon lives on the Start menu. In Windows 8 and 8.1, the People, Mail, and Calendar apps came as one bundle of connected programs. Open a contact’s name from the People app, and you could see all their activity: e-mail, posts from Twitter and Facebook, Skype messages and more. Facebook severed ties with Microsoft while Windows 10 was in development, and the People app no longer interfaces with Facebook in Windows 10 – or any other Windows version, for that matter. The loss of Windows Media Center in Windows 8 disappointed a lot of people. So many, in fact, that Microsoft let people pay a stipend to add it back. Microsoft isn’t offering that option in Windows 10. In fact, if you upgrade a PC with Windows Media Center to Windows 10, the upgrade process will peel away Windows Media Center, leaving it gone for good. Windows 10 no longer comes in a Windows RT version, and owners of Windows RT computers can’t upgrade to Windows 10. However, Microsoft plans to offer an update to Windows RT in September, 2015, that will add some Windows 10 features. Microsoft hasn’t specified exactly which features will be included in the update, though. Don’t hold your breath. In Windows 8, apps always filled the entire screen, or consumed half of it. 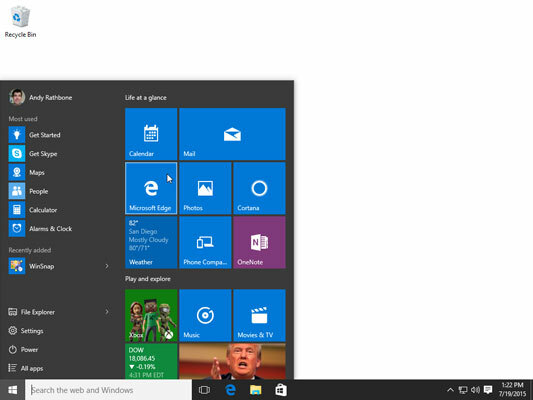 Windows 10, by contrast, treats apps just like desktop programs: They each run in its own window on the desktop. If you want, you can still enlarge an app to fill the screen. Just click the tiny square near its upper right corner. Windows 8 and 8.1 owners could browse their files through the OneDrive app. Microsoft pulled the OneDrive app from Windows 10, however. If you want to browse your files, you’re limited to the desktop’s File Explorer program. Another alternative is to download a file manager app from the Windows store.